Our new tool called CEREC, prepares and places natural-looking ceramic fillings for patients in a single office visit. No more mouths filled with silver fillings. No more messy impressions. No more monopolizing patients time by making them schedule two visits for lab-made crowns.CEREC uses CAD/CAM technology to design and mill precise restorations such as veneers and partial and full crowns, and all other single-tooth restorations. The restorations are made from a single block of high quality, biocompatible, anti-abrasive, and plaque-resistant material. What’s more, the ceramic matches the colour of the patient’s own teeth and will last anywhere from 10 to 15 years. First, the damaged tooth is prepared by applying a thin layer of reflective powder directly on the tooth’s surface. Using a special camera, a picture is taken of the tooth. This photo is a pen-sharp optical impression of the tooth and is used to create a beautiful ceramic restoration. Computer Aided Design (CAD) technology helps design the restoration from the optical impression. We are very excited to announce that Orangeville Dental is digital!!! Computerized digital radiographs take instant and extremely low radiation x rays or images– less than 90% radiation than conventional films. These radiographs use no film or chemical to process. This is great news for us and the environment! The image of the digital radiograph is projected in a matter of seconds onto a computer monitor for immediate discussion, assessment, education and treatment planning. There is no longer any wasted time on processing, retakes and mounting. Thus, our team spends less time in the dark room and more time with you discussing the health of your teeth. 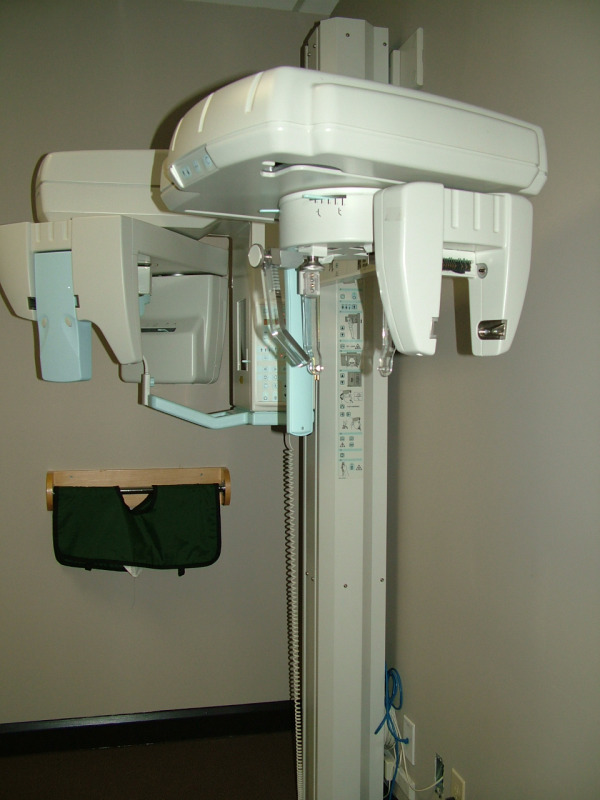 Dental x-rays are extremely valuable for helping to detect oral diseases of the teeth and surrounding tissues. The need for radiographs varies according to age, risk for disease and your past dental history. A panorex is more convenient than taking multiple x-rays and exposes patients to much less radiation. This type of x-rays is ideally used to assess: the condyles of the TMJ, jaw bone, sinus, bone levels around teeth, impacted wisdom teeth and any anomalies/pathologies in these areas. Radiographs of your teeth provide us with an excellent tool that shows the overall condition of your teeth and roots. X-rays can assist the dentist in determining potential problems such as abscesses, abnormal growths, and gum disease. They can also help in locating cavities and other signs of disease that may not be easily detected through a visual exam. During your examination, an Intra-Oral Camera is used to take pictures of your teeth (on left in picture). The Intra-Oral Camera is a tiny camera that is located at the end of small wand, and is small enough that it does not provide any discomfort to the patient. In every dental room, there is a television – the pictures taken using the Intra-Oral camera can be magnified and viewed on the television screen. This is an excellent tool for both the doctors and patients – they are able to look at any problem areas together and discuss future courses of action. We believe in providing the patient with as much information as possible, so that everyone is comfortable and confident with the issues and the solutions to make better informed decisions. The first step in dental cleaning is scaling – the removal of plaque and tartar from all tooth surfaces. Scaling is done both manually, by the Dental Hygienist, and done using a new technology called a Cavitron. The Cavitron is an ultrasonic scaler and polisher that works to remove and reduce tartar on the teeth. Having your smile rejuvenated is a big decision; but, it is a lot easier when you can see how your new smile will look before you commit to any treatment. Our office has chair side computers in all our operatories, in order for you to conveniently reserve your next appointment with us before you leave. We also use computers to store and retrieve your dental records, digital radiographs, photographs, insurance information, appointment scheduling and much more… We also have computerized consultation illustrations and EDI insurance online. Both infection control and proper sterilization techniques are top priority in our office. We focus on maintaining universal precautions and the strictest guidelines available. We use proper sterilization techniques & regularly maintained modern equipment to sterilize our instruments. Our clinical team wear eye protection, face masks, and change their gloves between each and every patient. Our sterilization equipment and procedures are regularly monitored. We have always met, or exceeded the high standards required to protect our patients from the risk of infection.